I am back at my quiet tranquil abode in Dongara again now, but my trip to Perth for the 444 Evening with the Archangels was wonderful! The evening was a total success with 28 in attendance including baby Nikki. There was a glorious chorus of Earth Angels in the room activating the Sounds of Light that they are now accessing since their work with Ametron Truth. It was so nice to see so many fa-miliar faces and so many brand new faces, so thankyou to all who attended, and thankyou to all of you who let me know they would be with us via distant attendance also!! It’s always great to know we are still connected and distance is no barrier. I will be back next month so please stay tuned for dates coming up. I bought myself a car while I was in Perth to get me around, only to give it back within the week as it turned out not to be not meant to be. How interesting and abso-lutely amazing that the seller of the car said yes he would give me my money back because I was not happy with it. How many times does that happen? Defi-nitely another Earth Angel sent my way. We have now become friends and it just goes to show that our world is moving into a completely new direc-tion with Angels abounding everywhere! As it turns out I need a new laptop far more than a car at this stage and so I have ordered my new laptop to get me on and upward with the book and more! 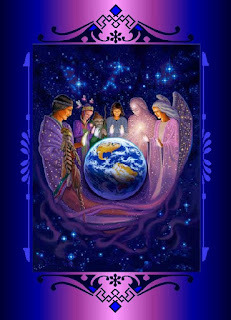 Now talking about Earth Angels, I may not have mentioned the power of the Angels around us this month of April 2011. Because of the double 4’s (April 4th month and 2011 2+0+1+1=4)we have the angels so close to us all month. This makes for such a perfect time for having healing. It is clearly obvious, to me anyway that many of us espe-cially within the LUXOR Light groups are being placed in our place of purpose at this most powerful and dynamic time as we move through the Changes. What is not clear to many however, is that this can only be a struggle if we do not listen to the directions we are being given. Ask yourself this question: do you see Chaos or do you see change? Many times over the years I have been accused of having “too much Chaos” around me. I now laugh when this infor-mation is passed on to me, but once upon a time I was shocked to think that people saw my life as one of Chaos. I have never seen it that way. I see is as one of Change. I see myself as One who accepts Change and to be One who is willing to make the change quickly. It’s funny the perceptions of others and what they see. But the reality is that what we see in others is exactly what we have in our-selves. Everyone is a mirror when you perceive our world from the viewpoint of outer realities instead of becoming Aware of our Inner Realities. The beginning phase to Enlightenment is becoming aware of our own Inner World and being willing to understand and get to know it. The Angels are working with us (when we ask them to), so if you are about ready to accept your Liberation—which is exactly the frequencies just wel-comed into the LUXOR Light Mo-nad; the Universe can only help you with the ingredients that is at hand. Without going into too much detail, I simply wish to ex-press to you, to look at what is happening around you and maybe the so called chaos or struggle is actually a sign of the Universe trying to give you your Freedom. “GOD works in mysterious ways and sometimes Bless-ings come in strange disguises. Open your eyes, your minds and your hearts and “SEE” what is being offered to you. If you are unsure ask the Angels to help you to see what is being offered to you............I promise you will be pleasantly surprised! Do not FEAR for there is nothing to Fear but Fear itself and where there is LOVE there is no fear so take a deep breath and welcome the Changes! These following dates are Power Days and perfect for Healing or for Soul Energy Reports. When you order your Soul Energy Report you receive a minimum of 1 hour healing energy di-rected your way including a full report on the Efficiency and health of your Energy Field and an explanation to help you understand the level of consciousness you are accessing. You receive guidance and sometimes messages to help you to awaken to the next level of consciousness that is waiting to be accessible to you. The colours will help you be in the Flow! Soul Energy Reports are $100 or $90 for Associate Members of LUXOR Light. Today, 15.4.2011 Here we go, here we go, here we go.... Welcome Friday the 15th!!! This is a day of super importance. This is the very same energy we activated on 10.10.10 and is in direct relation to the New Dawn and welcoming the Fifth Element, the Quintessence of Sound and the Awakening into a world of Truth and Integrity! It’s all about CHANGE and THE CHANGES!! And the Angels say Embrace the Love energy around today. Wear Royal Blue with a dash of green and orange!! But wait there’s more!! Saturday says loudly “would you like to welcome your Mission? Would you like to add power to the force that awakens that part of your Soul that that naturally directs you toward the next step in achieving and recognising “what you are here for?” Today is a great day for that. This is a double doosey when it comes to Awakening. The 16 frequency is in your face like a banner calling to Wake Up. Now you may think you are Awake but there is always more to Awaken to... Grasp and don’t let go!! The Angels say you are on a role so make the most of it. 17.4.2011 Messages are coming to you in all manners of ways today. Watch the signs from the Animal and Plant Kingdoms and whatever Mother Nature has to tell you. Eyes and Ears open today. And the Angles say Abundance is yours just open to receive! Wear Violet with a touch of yellow and green! 18.4.2011 The abundance flows over into today and anything could happen today. It’s a reap the rewards day today but don’t forget to share your blessings with others. And the Angels say “some things just need to come to an end, so let go of the hanging on and you will reap even more”. Wear Magenta with a touch of yellow and blue! 19.4.2011 A blending of the higher minds today will give you the access you need for insights and wisdoms that just seem to have been alluding you. Don’t get bogged down in the woes, it’s only tem-porary. The Angels suggest you think about what comes after you say goodbye to the old you and are willing to accept the new. Wear Gold and add some yellow and deep blue! 20.4.2011 Oh what a beautiful morning, oh what a beautiful day! All you need to solve your deepest inner mysteries!! Listen to Soul touching sounds and music today—very important. A very powerful day for Healing as the energy holds aligns with the sacred ar-chitecture of hu-manity. The Angels say they are ready and will-ing to help you create today - all you need to do is ask. Wear Red! Add some crazy yellow and violet and let the world see you coming! Day of great power for shifts in conscious-ness. Dreams and visions, rewards and lots of spiritual growth opportunities today. Look deep within today and notice the mir-rors that come your way. It’s your stuff not theirs! The Angels and the Archangels and the Ascended Masters wish to be of service to you today. Go on ask them, you just might get the help you have been waiting for! Wear Greens and feel the healing power at work! 22.4.2011=39/3 (GOOD FRIDAY) Glory Be - Divine Blessings of the Masters are with us today in a really Big way. Today dare to do something that you have wanted to do for a very long time. See things as greatness at work because you are greatness at work. Joy and Happiness is yours for the taking!!! Wear Yellow and Gold and be the God/Goddess you are! 23.4.2011 Hidden numbers abound today… we have gateways hidden just beyond the surface; transformation beckoning if you are willing and if you are the Angels once again say WELCOME THROUGH THE CHANGES!! Wear Green and carry your Heart Open today and Receive! Wear Blue with a dash red and green. Love love love… marriage of opposites and the law of give and take are at work hard to-day. This is a vibration of Love! The Angels say you are on a roll, keep up the good work! Wear Royal Blue/Indigo and a dash of green and orange. 27.4.2011=44 A day of re-evaluation, a turn around point holding great opportunity. Tap into your Universal and Cosmic Mind for the wealth of wisdoms available to us today. The Angels say release and let go of anything that no longer serves you it is only weighing you down on your dream of reaching higher Realms. Wear White today and be Pure! 28.4.2011 If you didn’t let everything go yesterday today gives you another chance to let it go. If you thought about it, then good chance it needs to go! Com-pletion time and Transformation Time! The Angels say the Newness awaiting you is filled with Spiritual Gifts. 29.4.2011 This is the Good Karma day—a God Day. Lots of new opportunities available here.. Successful vi-brations. Human emotions purified and transmuted into compassionate love. The Angels offer great healing on this day. Today you may be faced with tests in rela-tion to vanity; fame; ego; illusion; jealousy; frivolity and glamour. It’s time to realise these are worldly attributes that leave you floating in in the clouds but cer-tainly don’t represent the real values we are here to learn. Wear Green with some violet. That’s all Folks, if you would like a healing this month choose the date that feels right for you and get the ball rolling with the energy of the Angels to nudge you along.